Welcome Cerro 8....Eleven months out! This week has honestly felt like a dream with Elder Huntsman. We kept just asking ourselves when the divisions were going to end. In fact, we woke up on Thursday and the first thing he said to me, "What are you still doing here?" It has been so much fun so far and the area is super awesome. 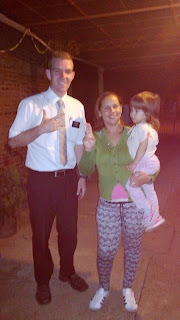 I am really confused still in the area, I just follow Elder Huntsman around.... it´s been pretty great! I have met a lot of people which has been a lot of fun, the people here are so different from Salto, but so nice. They are constantly doing stuff for us as missionaries. Mommy.. no worries about the area. Huntsman and I don't want to get killed or robbed either, and Huntsman is smart about where we go. We only carry our Books of Mormon, Hymn books and some pamphlets....nothing more. However, the Lord is truly always watching over us! My second night here we woke up and we forgot to flippin lock the door.... we both just looked at each other and said, "That was really intelligent." We now make sure the door is locked every night! No stove in our house so we are safe from that! The ZL's live below us. They have the fridge and the stove. There is also a gate that is around the house too so we are pretty safe. President takes good care of us. Besides just always laughing and having a good time, the work this past week went pretty well too. As crazy as it is that we are comps, and as much as we are having a great time together, I admire the way that Elder Huntsman loves to work. He may deny it but he really did learn how to work from Elder Caires Franca, and it will help him for his whole mission. He is a great companion and we are super excited to be together. Love him like a brother. He is actually cousins with the Miller family.... Zach, Sam, Max, Austin. So yeah, Hunstman's mom is a Miller. There is an absolutely beautiful view from the house like a block up. If you guys type in Cerro Fortaleza Montevideo, a fort will pop up. We live like 2 blocks down from it. 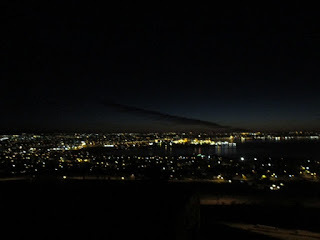 We are on a hill that looks over all of old and new Montevideo. It's super awesome! Things here have been really good. I don't have too much to say about the area just yet.... but in the near future there will be pictures of us and a lot more details about the people here! Being a District Leader is different and I wasn't quite sure what to do for my first meeting. Luckily I got a paper from the ZL's the day before my meeting which helped me with my first meeting. My district is Elder Choi and Elder Hodges from Cerro 1. Elder Brown and Elder Espinoza from Las Torres (Cerro 1). 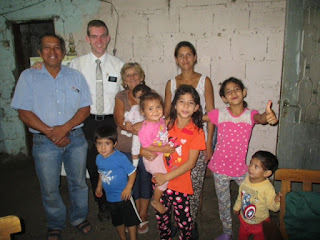 Elder Degn and Elder Gonzalez from Casabo (Cerro 8). I love them already. It has been fun talking to them on the phone and being able to have a district meeting with them! It is awkward because Elder Brown was the old DL here. He was DL for 5 changes, and this change he got bumped down to just Senior comp. I just feel like I am so young compared to my district. Elder Gonzalez and Elder Choi die this change with Elder Devashrayee. Elder Degn has 2 more changes left and Elder Brown has 3 changes left. Then comes me....Mr. 11 months. Super weird being young trying to teach them, but it is good. I will just continue to put my trust in the Lord as he has put His trust in me. It will be an awesome change. Well, that is all folks. I sure love you all sooo much and I am grateful for your love and support in all that I do. You all make me the happiest missionary there is! I am healthy now too. Healthy and happy.... couldn't ask for much more! Blessed Elders here! Have a wonderful week! I LOVE YOU! One hard goodbye.... Familia Camargo. Macarena, Emili and Raquel. 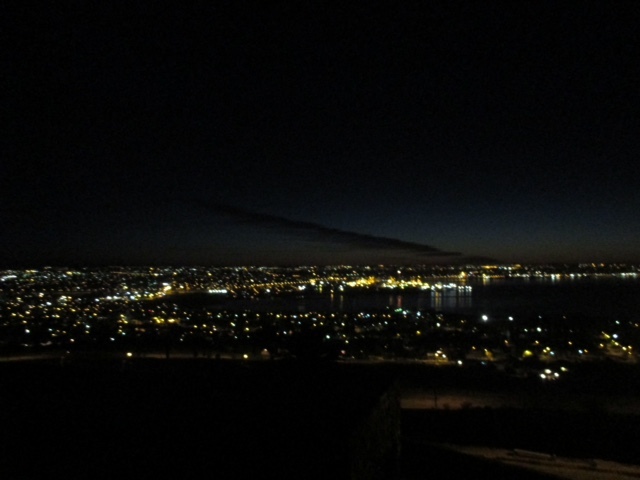 The view this morning from the fort after a 3:42 run up the hill. So pretty. I hope you know how much I truly love you. I love every email I receive, and I am so grateful for you in my life! I will be leaving Salto. It has been a good run here for just about 7 months. Three more days would be 7 months. I am sad to be leaving all the wonderful people here. I have truly made many friends and it has been hard to say goodbye...but the way I look at it, it is only more of a "See you later." I am super grateful for the time I have had here. I know I was supposed to be here for all of this time. I know that the Lord is very aware of my needs and I am very grateful for each change that I have had here. I am also grateful for each of my companions. There has been some ups and downs.... more ups than downs obviously.... but I am grateful for my companions because I know without each of them I wouldn't be the missionary that I am today. I am grateful for the love that I have found in the work here. When I was with Elder Vargas I saw some real changes in Marcia and Irene. I thought that was the reason I was here for so long, was to really build a testimony that the gospel of Jesus Christ changes lives. I can now say with a surety in my heart, that the Church really does cause a change in the hearts of people. However, I don´t think that was the only reason that I served here for so long. I really believe that is was to find Emili and Macarena, and to be a part of their lives. They have changed my life and the way I look at the work. I have learned so much here. I have learned how to be humble, how to speak the language, how to teach with the Spirit and how to be a missionary. However, this isn't the end of the journey...only a new beginning! I will be headed to Montevideo which is my first original zone! I will be serving in a different part, but I will be able to talk to the missionaries that are in Delta and check up on Gladys. I am super excited. I will be working in Cerro 8. To be honest, it isn't the safest area, but I know that without a doubt my comp and I will be protected. President Smith actually works a lot in the ward because he served there 38 years ago. Words can't explain how excited I am for this change. I am excited to head out on a new adventure and with a stud missionary companion, Elder Huntsman. There is one slight change that I just figured out this morning from the ZL's here.... I will be District Leader. I am nervous and not sure what to think. I sure do love you all. I hope you all have a very happy week! Keep smiling! Me and my new companion....Elder Huntsman! Finding JOY and LOVE for missionary work! This week up here in Obelisco was one to remember. I am so grateful for the people here and for all that they do for us. As we have been planning for awhile now, we had 2 baptisms. Macarena and Emili were baptized, and it was a wonderful experience. The weather didn't function too well, but all the people that needed to be there were able to be there and it ended up being really special. The girls are really smart and have made a big impact on their mom and all of their family. Right after the baptism, after all was said and done.. we sent out a message thanking them for the wonderful experience and for all that they did for us leading up to the baptism. We received back a message that touched my heart. She said that she feels we were really sent to the little girls for a reason and now she feels like she needs to really push to be married so that she can be baptized. She also told us that the example of her two girls will be a huge help to their dad. It was really neat to receive her message. As I was thinking about the baptism on the following morning, I was just filled with the spirit. In my morning prayer I had a feeling that I haven't ever felt before. I truly believe that it was pure joy. I love missionary work. These girls here have really opened my eyes to the work and all the many blessings. They have sure made it easy to love the work as we sing hymns together, and they always have a smile on their face. It has been so humbling to see how they have changed and how much their mom has learned too! And to think that none of this would have happened if the grandmother didn't call us during a weekly planning session, asking us to come to the house to teach her daughter in-law. God really does work miracles! In all my time here in Obelisco, I think from all the things I have learned, this will be of most value, because I found joy and a love for the work. I am so blessed to be a missionary! I love you all! Have a great week! Emili and Macarena after their confirmations!